Parasites are among the most common pathogens recorded in dogs. High prevalence rates are usually reported in stray and shelter dogs, as these animals are less likely to be tested and treated. In this study a survey was carried out on intestinal and lung parasites of stray dogs at the moment of the admission in a shelter in Central Italy. In the period June 2014–June 2015, 262 individual faecal samples were examined. Twelve parasitic taxa were detected. Helminths were more prevalent than protozoa (61.8% and 25.6%, respectively). 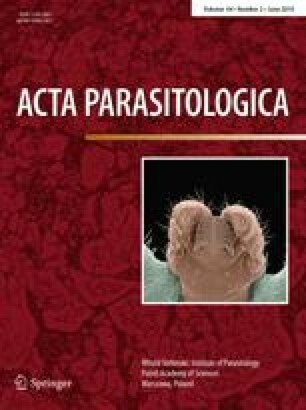 Ancylostomatidae showed the higher prevalence (40.5%), followed by Giardia duodenalis (21.4%), Toxocara canis (20.6%) and Trichuris vulpis (17.6%). Angiostrongylus vasorum was the most prevalent lungworm (12.6%), Crenosoma vulpis being recorded just in one dog. G. duodenalis had a high prevalence, probably because of the diagnostic techniques adopted, actually the most sensitive available for its detection. Nevertheless, the zoonotic potential of this parasite in dogs appears reduced, as all the isolates were identified as C (24.0%) and D (76.0%) dog specific assemblages. Taeniidae constituted a high potential zoonotic risk, as from the eggs it is impossible to exclude they were Echinococcus granulosus, the most relevant zoonotic parasite in Europe. The present study underline the importance of stray dogs control, aimed at preventing or minimizing parasitic spread and zoonotic transmission. An erratum to this article is available online at https://doi.org/10.1515/ap-2018-0052.